To those of us with an interest in the Luftwaffe, Erik Mombeek is a name we know well. This is his latest book on the subject and the most recent in his Luftwaffe Gallery Special Album series. The book concentrates on JG 5, a unit that operated in Northern Finland and Norway in one of the more hostile environments for aircraft. Bitter cold in the winter with lots of fog and generally poor weather year round, just getting planes into the air was often difficult. Yet the pilots of JG 5 did the best that they could under the conditions. Several of their forward bases were only 100 km from Murmansk and while the German Army tried to cover that fairly short distance, such was the terrain that they were completely unable to do so. Still, this was an important port for supplies reaching the Soviets for use in other fronts and it had to be constantly attacked. This fairly short distance also meant that it was relatively easy for the Soviets to bomb and strafe German air fields so it is not like there was a dearth of combat. JG 5 was not strictly based in the far north and portions of the geschwader were also sent to other fronts on temporary assignment. This book is as much a photo book as it is any sort of detailed history of the unit, though the book does follow a chronological order from the formation of the unit until the end of the war. It is full of great photo, hence the landscape format. Many of these images are from private collections and provided here for the first time. In addition to the great pilot stories, we are provided with some outstanding full color profiles, each one based on a photograph in the book. The end result of this superbly researched book is not only a decent unit history, but a great reference for modelers and enthusiasts alike. It is a book that I give my highest recommendation. Review book courtesy of Erik Mombeek. 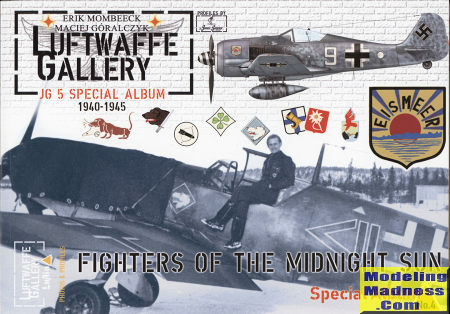 Visit www.luftwaffe.be for more information.